It’s amazing how quickly this summer has flown by, especially these last few weeks since I last posted. After all the shoulder problems, then out-of-nowhere back issues that suddenly disappeared as quickly as it had come, I decided I needed to get back to the exercises I’d been slacking off on for a number of months. After some talking with Matt about it, we joined a gym! It’s kept me fairly busy. I’ve been feeling sore and like I have less time to just be lazy, but overall I feel really great about going consistently for the last two and a half weeks that we’ve been members and like I’ve had more energy. Around the same time we joined the gym, I saw a physical therapist about my shoulder problems. She gave me some exercises to do that I’ve kept up with and I haven’t had any problems since. I’ve been knitting the last couple weeks without much problem (a bit of soreness here and there, though that’s likely to the gym not a reoccurring shoulder issue!). I did start the Jumper Cardigan I talked about in my last post. I knit the right and left fronts and started the back. The color isn’t very accurate. The swatch from my last post is much more accurate, though possibly just a smidge brighter. 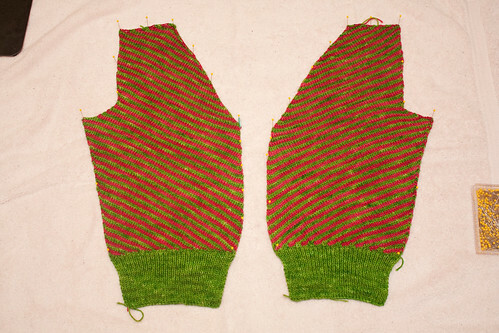 Speaking of color… the color combination started bothering me after I’d finished the fronts. I started the back anyhow, but had this nagging “These colors are so bright…” thing in the back of my mind. The color combination is great and I do really like it, however it’s just not very “me” and something that I would get a lot of wear out of. On top of that, I measured (my gauge didn’t change with the washing/blocking of the swatch) and it was going have about 4″ of positive ease in the bust without the additional 1 to 1.5 inches of the button band. Then I settled on a sweater: Cottage Garden. What sealed it for me was pulling out the yarn (such a soft wool/silk blend), thinking about how I bought it last year at Rhinebeck, and thinking “It would be great to wear the sweater I knit from yarn I bought last year!” So, I knit, washed, and blocked a swatch to check my gauge. 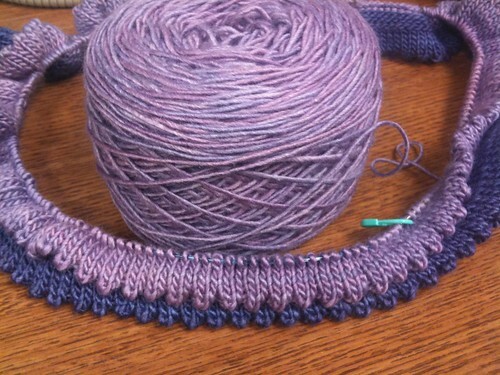 This yarn? Brooks Farm Solo Silk? Amazingly soft and wonderful knit up. It was done – this had to be the next project I knit and it needed to be my Rhinebeck sweater. I’ve been working on the Maelstrom socks and now up to the heel on the second sock. I had some time between frogging the Jumper Cardigan and starting Cottage garden to finish up the leg since I was being indecisive about what to do. It’s been put aside to knit Cottage garden for the most part, though I’ve picked it up a few times while watching TV. Minty Fresh may well get frogged. I hibernated it because I lost interest and I don’t really have any plans to go back to it for now. We’ll see. Still have the Jaywalker socks on the needles, but I think I’m going to wait until the circular from Maelstrom is free or I break down and buy some more Knit Picks circulars in sock sizes to continue work on them. Your photos are gorgeous as always and I really like the jacket – the construction looks very cool!